Let’s start with giving all Americans, regardless of age or zip code the ability to access and pursue the education that best suits them. Students should be judged not on how many days or years their butts are in seats but whether they’ve achieved competency. Carnegie units are yesterday; personalized learning is today. Globally competitive schools require the ability to turn on a dime, to iterate, innovate and accelerate learning. Let’s get the rules out of their way, and reward success, not failure. Education reform is the quintessential bi-partisan issue, so please stop shooting the messenger! True innovation in schools requires internet access and access to teaching and learning anywhere, particularly for rural students. Let’s put infrastructure dollars to use in expanding the digital footprint to underserved communities. A good illustration of why this is important, is found in this Special Report on Rural Internet Access. GUESTS WE’D LIKE TO SEE THERE: There are fabulously successful charter schools in and around D.C. One of their principals and/or students should be the First Lady’s guests in the House gallery and acknowledged by the President from the podium. Teaser: here are the special guests you will see tonight. MY CHILD, MY CHOICE – MI HIJO, MI ELECCION. 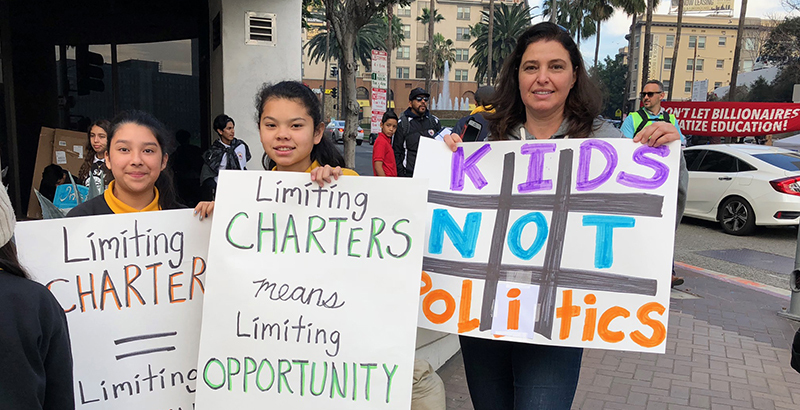 These were the chants of more than 3,500 parents, largely from disadvantaged communities, who showed up to support Los Angeles area charter schools after the teacher’s strike. These are the real people and their children who are lifted up by true alternatives in education. They need to be heard. HIGHER ED WISDOM. Hillsdale College’s Larry Arnn is joining the chorus of people questioning ‘is college for everyone? If not, what is?’ Unlike most who pose the question as if there are only two alternatives, this college prez’s opines on the purpose of education. And guess what? It’s not just about a job. “The ultimate purpose of an education — to teach people how to live, to introduce them to the great questions that shape a good life and the variety of robust answers people throughout human history have given to such ultimate questions. This gives the young the mental equipment they need to pursue their own good life, rather than leaving them, as our education institutions largely do now, adrift in the ocean with no food, no water, no map, and no rudder.” Well worth a complete read. GEORGIA PARENTS WIN. One of CER’s basic tenets is that students of all ages should be able to learn wherever they are and at a pace that suits them. From Georgia and Texas come examples of the real world impact of online learning on real people.